Teaching assistants have become an integral part of classroom life, yet pioneering research by the authors has shown that school leaders and teachers are not making the most of this valued resource. Results from the Deployment and Impact of Support Staff (DISS) project showed that the more support pupils received from teaching assistants, the less academic progress they made. Yet it is not decisions made by the teaching assistants themselves, but decisions made by school leaders and teachers about how their support staff are used and prepared, which explains these provocative results. Prompted by the wake-up call the DISS project findings provided, this timely book of guidance will help school leaders and teachers in primary and secondary schools improve the way they use teaching assistants, and will add real value to what can be achieved in the classroom. Based on the authors’ collaborative work with schools in the Effective Deployment of Teaching Assistants (EDTA) project, this book provides essential, practical tools and classroom-tested strategies that will allow schools to conduct a fundamental review of current practice and provides a framework for reforming teaching assistant deployment and preparation, and the way they interact with pupils. 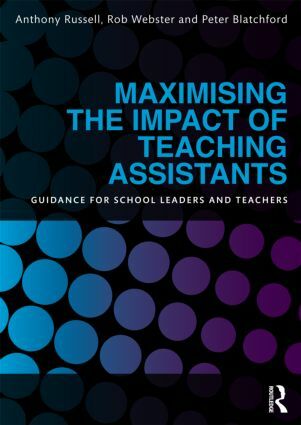 Maximising the Impact of Teaching Assistants provides much-needed and well-informed guidance on how to unleash the huge potential of teaching assistants working in schools and is essential reading for all school leaders.